The book presents problems tackled from different perspectives, by analyzing the main technical aspects of the surgical technique but also functional and metabolic issues. It also discusses concepts such as ischemic preconditioning and ischemia-reperfusion mechanisms, as well as innovative investigational approaches. In the ?endovascular era?, it highlights the most recent updates in complex endovascular repair involving renal and visceral arteries, providing both practical tips and tricks and outcomes analyses. 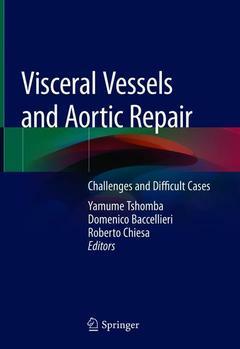 This volume represents a powerful tool for both young and experienced operators who wish to approach the complex aortic pathology either by open surgery or through endovascular methods.? Anatomical overview and imaging of the aorta and visceral arteries .- Physiopathology and anaesthesiological management of supravisceral aortic clamping.- Perioperative renal pharmacological protection during cardiovascular surgery.- Renal protection during open aortic surgery with Custodiol solution.- Renal artery stenosis associated with aortic disease: timing and outcomes of operative management.- Renal arteries anatomic abnormalities during open abdominal aortic repair.- Renal transplantation and aortic disease: operative management.- Pulsatile perfusion of kidney allografts.- Endovascular aortic repair: the renal side of the story.- Challenging infrarenal aortic necks in EVAR: devices evolution, long-term results and new concepts .- Open repair of pararenal aneurysms: renal vessels surgical management.- Endovascular repair of pararenal aortic aneurysms: the management of visceral arteries with fenestrated technology.- Emergency kit for chimney technique for ruptured abdominal aortic aneurysm.- Current treatment options for complex aortic pathology with visceral arteries involvement between open and endo: single center experience.- Aortic “coral reef” with visceral arteries involvement: treatment options.- Thoracoabdominal aortic aneurysm open repair: visceral arteries reattachment strategies.- Sutureless anastomosis during thoracoabdominal aortic repair.- Tissue ischemia during aortic surgery. The point of view of the perfusionist.- Ischemic preconditioning: the rationale and evidence based outcomes.- Intraoperative neurophysiologic monitoring during aortic surgery: basic principles and clinical experience.- Long-term patency of visceral vessels after thoracoabdominal aortic repair.- Fate of Carrel patch after thoracoabdominal aortic repair: treatment options for recurrent aneurysms.- Total endovascular repair of thoracoabdominal aortic aneurysms: lessons learned.- The SpiderGraft for Thoracoabdominal Aortic Repair: rationale and indications.- Visceral ischemia during type B dissection: incidence, prognostic value, diagnosis and operative management.- Visceral ischemia during acute type B dissection: limits of current approaches and new perspective.- Epidemiology, diagnosis and clinical management of arteritis involving visceral vessels.- Visceral arteries involvement in Takayasu patients: treatment options.- Aortic infection with visceral arteries involvement in the endovascular era: treatment options.- Deep vein reconstruction for infective aortic syndromes with visceral arteries involvement.- Vena cava oncologic surgery.- Rerouting of visceral arteries during hybrid thoracoabdominal aortic repair: a still useful solution in highly selected case.